Finally, home-sweet-home for your Arduino projects! Made from sturdy, lightweight powder-coated aluminum, the Crib for Arduino can accommodate either an Arduino Duemilanove or Arduino Mega with head room to spare for a shield like an Ethernet shield. This enclosure weighs only 5.6 oz (159 g) and is structurally very strong. 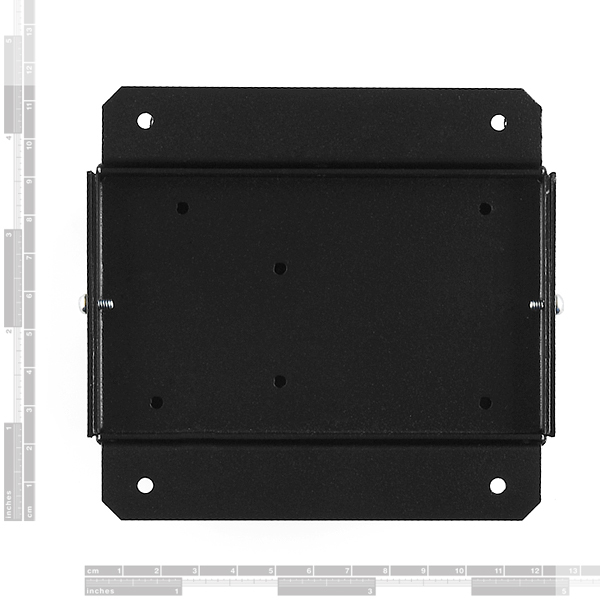 The baseplate is pre-drilled with hole patterns for both Arduino boards(Main and Mega) so you get perfect alignment and no hole drilling for board mounting. Use the snap-in standoffs to quickly mount your board and go. 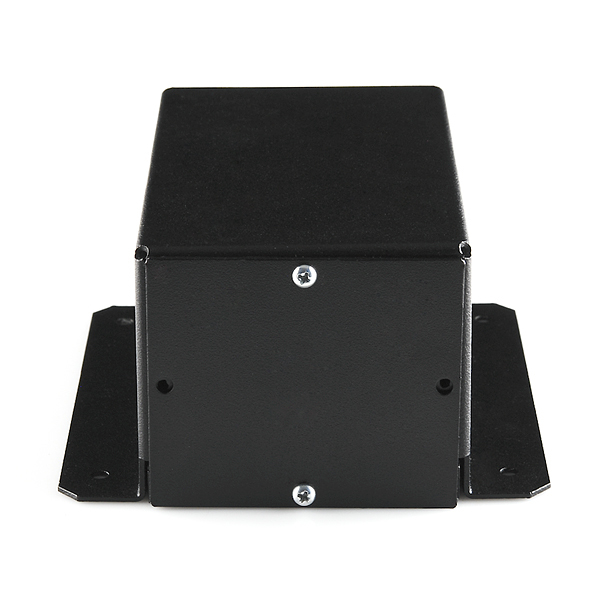 Flanges on the lid let you mount your project anywhere with just 4 screws. Bolt it securely under your desk or to the ceiling! Or just insert four rubber feet (not included) into the flange holes so your Arduino project can sit on your desk and not scratch it. "We expect some of these to arrive next on Sep 24, 2014." Anyone know when these will be back in stock? I need about 15 of them! could this fit an aditional shield (xbee shield) on top of an ethernet shield? probably not. it has just enough room for the arduino and one shield. there's not much room for anything else. You can definitely fit two shields on top of a standard Arduino in this case. You don't get much room for connectors for the top shield because of the lip for attaching the faceplate, but there is about 15mm of clearance for components on the top shield. As for xbee, I'm not sure how well that would do inside a thick aluminum enclosure. I'd be worried about signal attenuation. I actually have come to hate this case, it created more problems than it solved. My ire was fully aroused by sloppy execution of the mounting plate which is completely worthless due to holes that aren't where they should be. Wish I could have "volunteered" it for the scientific case testing you guys did last week. With the pickup truck. Can you please carry Fez faceplates? I'd love to be able to get one. 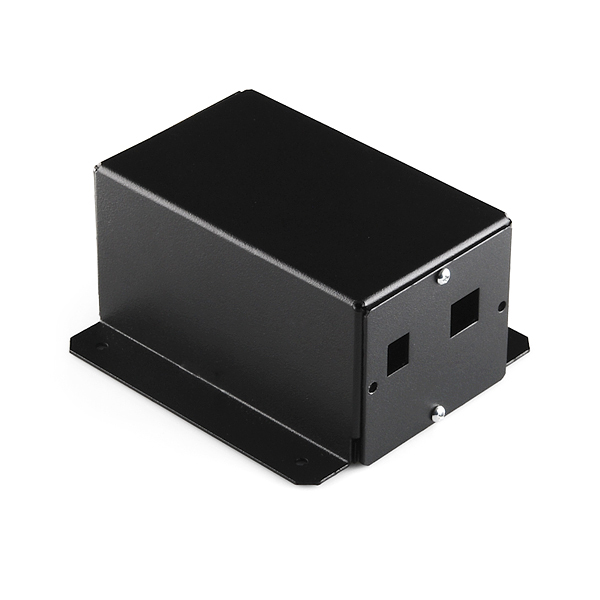 Would the Joystick shield fit in the top level of this enclosure? I have the capability of milling out the openings if it does fit. Just got mine and it looks great. The front left standoff hole is a bit shy of the hole for my mega 2650 (or maybe my mega is off) but it was only about 1/16" and a little wiggling solved it. It looks like the screws are supposed to bore into the pilot holes a bit so I recommend driving a screw into each hole once with a solid screwdriver to ready the holes before filling it with electronics. Once assembled, it makes a very secure holder for the arduino. I got the ethernet faceplate and it makes a snug and solid fit. There is room for two shields (ethernet plus one) as long as your top shield is not too tall (about the height of a stacking header. Having this solid serviceable case will really help me test my device in the field. Thanks guys!! I concur! I needed a solid enclosure for a home automation project. I thought the price was a bit steep when I ordered, but now that I have it in hand I can see it is worth the price. It is solid and very well made. With two proto-shields installed, there is 15mm clearance for components on the top shield (15mm between the board top surface and the inside of the top). It's powdercoated aluminum plate, not plastic. Yep, if you want cheap, the plastic case is quite nice. And if you want something more substantial and NOT plastic, get this one. Call a machine shop and price it out. These aren't being built in the thousands. Materials are expensive and powdercoating isn't cheap. Neither are square cutouts.